The cold open focused on all of the currently announced matches for Homecoming and the debut of The Rascalz, which seems to have garnered more buzz than expected. Good opener. The match started with Willie Mack overpowering Crist and using his athleticism to take the early upper hand. Mack got distracted when Sami Callihan grabbed his foot as Mack was running the ropes, allowing Crist to cut off Mack's dive attempt and get control of the match. Crist mostly went for quick chokes, distracting the referee every now and then so Callihan could get some cheap shots on Mack. After a few minutes, Mack finally made a comeback by catching Crist with a big lariat, a pop-up forearm, and a Codebreaker for a near fall. Mack went for a top rope move, but Crist cut him off and went to hit a superplex, only for Mack to counter and hit an ugly looking sunset flip powerbomb -- Crist pretty much landed on his head. He managed to get up and hit a superkick to level out Mack, who followed with an exploder to the turnbuckle for a two count. Mack placed Crist in the tree of woe and went for a Coast to Coast, but he got stopped by the distraction of oVe. That gave Crist the opportunity to hit a top rope cutter for the win. Jake Crist qualifies for Homecoming's Ultimate X match. Back from commercial, Tessa Blanchard cut a promo saying that Taya Valkyrie is nothing more than Johnny Impact's wife because she doesn't have the Knockouts Championship. Blanchard said that Valkyrie only has Johnny, but she has Mr. Impact Wrestling himself -- Moose. Moose cut a promo too, saying he sent Eddie Edwards to a mental hospital, and tonight he defeats Johnny Impact. Good work by both. Monroe went for the attack early on, hit a flurry of forearms, elbows, and went for a quick pin, only for Dark Allie to kick out at one and hit a backstabber to cut her off. Allie started her offense with strikes on the mat and stomped and choked Monroe against the ropes. When Monroe tried to make a comeback, Dark Allie simply stopped her and stayed on the offensive. Allie hit a neckbreaker and a senton for a two count. The finish saw Monroe dodge a superkick, only to catch a second one, followed by a Codebreaker, and Allie finally picked up the win. This was somewhat sloppy and longer than it needed to be. After the pin, Dark Allie put on Su Yung's dirty glove and locked in the Mandible Claw on Monroe until Kiera Hogan came down for the save. Hogan tried to talk some sense into Dark Allie, only to be taken out with a forearm by Allie. Su Yung joined the attack, and Dark Allie finished Hogan off with a Codebreaker. Back from commercial, Willie Mack and Rich Swann were talking about oVe interfering in Mack's match. Swann doesn't want to start a war with oVe and talked Mack out of doing so too. Swann asked Mack to back him up next week as he takes on Dave Crist in another Ultimate X qualifying match. Raj Singh started the match against Drake, overpowering him and forcing him to tag Lemons, who is somewhat bigger and made a stand against Singh, only to be overpowered too. Drake came in -- and once again got overpowered and taken out with a knee version of the Doomsday Device. The Desi Hit Squad continued with the double team as they stomped Drake in the corner, making quick tags. Lemons came in without a tag, but he got taken out with a series of rolling cannonballs in the corner. The finish saw the Desi Hit Squad win with a fireman's carry and jumping knee combination. This was an okay squash. Backstage, Matt Sydal and Ethan Page were getting ready. Sydal was sharing his teachings, pushing Page to open his third eye. Page was doing curls instead and blowed off Sydal, telling him that he needs to get ready too. Back from commercial, Katarina was being interviewed by McKenzie Mitchell. Katarina talked about Jordynne Grace coming in and using her to try and get over. She warned Grace that when someone crosses Katarina, they disappear, just like Grado and Joe Hendry got taken out by Murder Clown. She introduced Ruby Raze as her new enforcer. The GWN Flashback Moment of the Week was Chris Sabin cashing in Option C and winning the World title from Bully Ray at 2013's Destination X.
McKenzie Mitchell was waiting outside the Impact offices, waiting for Eli Drake to come out. Drake has an invitation from Abyss to a Monster's Ball match for Homecoming, and Drake was complaining to Impact office that a piece of paper is not how a match should become official, but he will take on the challenge and make an example out of Abyss. Back from commercial, The Rascalz were doing their That 70's Show skit, but this time, Scarlett Bordeaux was with them, telling them that she was impressed with their match last week. She then suddenly disappeared into smoke. This started with both men doing a series of locks and reversals, with Page showing that he has learned Sydal's style and coming to a stalemate. As Page started getting the upper hand, Sydal got more aggressive, showing that he hasn't taught Page everything that he knows. That prompted Page's aggressive side to also come out. Both started going back and forth, with Page using his strength advantage and Sydal using his speed and superior technical expertise. Sydal took Page down with a jumping kick and started his offense, taking out one of Page's legs and targeting the head, earning a two count after a running knee to the corner. Page made a comeback as he caught Sydal's plancha into a tilt-a-whirl backbreaker out of nowhere. Page got a near fall after a big boot and hit a cutter on the apron, with both men landing on the floor. Back from commercial, we found both men chopping each other. Page got the advantage and set Sydal on the corner, only to be countered. Sydal took down Page with a hurricanrana. Sydal started to chase the Shooting Star Press, but Page managed to cut him off and hit a Swanton Bomb for a near fall. They started trading quick roll-ups and reversals until Page managed to keep Sydal down on one of those for the three count and qualify for Ultimate X. After the match, Sydal put over Page. We jumped to Shady Acres Psychiatric Hospital with Eddie Edwards playing chess with Raven! Edwards was going crazier saying that he doesn't belong here, that everyone says he takes things too far, but Raven told him that he hasn't gone far enough and he shouldn't allow Alisha or anyone to decide how far he takes his actions. Raven got Edwards a keycard in order to escape and told him that he owes him one as Edwards ran off. Back from commercial, Pentagon Jr. and Fenix were backstage and were met by LAX and Konnan, who told them to keep it friendly, even bringing up Daniel Cormier and Cain Velasquez not fighting because they're in the same camp. He asked both teams that they promise to keep it friendly, but they were already starting to talk about who the best tag team is, and as usual, Pentagon got in people's faces with his Cero Miedo taunt, causing Konnan to get mad and storm off. McKenzie Mitchell interviewed Johnny Impact and Taya Valkyrie. 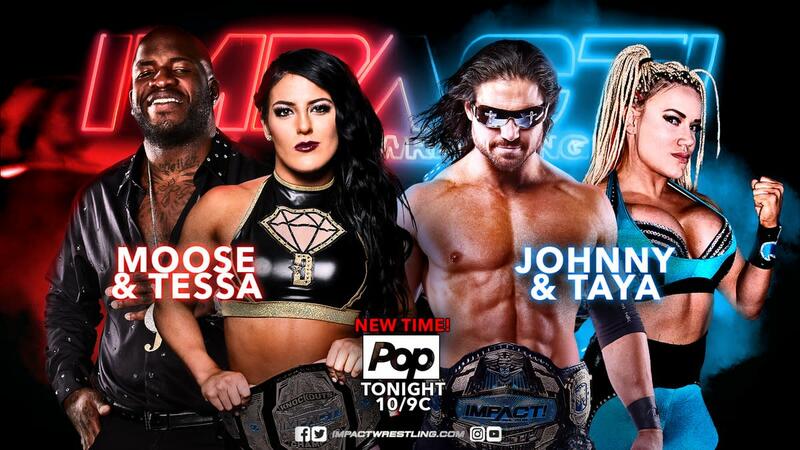 Impact said that he is preparing for Homecoming, but tonight he has to take on Moose, and it's a special night since it's the first time he and Valkyrie are tagging together. Valkyrie said that tonight, Tessa Blanchard gets a small taste of what La Wera Loca is bringing to Homecoming. Impact and Moose started the match, with Johnny getting the upper hand and forcing Moose to run to Blanchard and tag her. The women came in, with Valkyrie working a lucha style and also getting the upper hand until both Moose and Blanchard found themselves outside the ring and taken out by Impact and Valkyrie's synchronized assault. Back in the ring, Impact and Valkyrie got distracted playing to the crowd, allowing Moose and Blanchard to attack them and toss them outside the ring. Back from commercial, Blanchard had control over Valkyrie, working her back with a series of kicks and running knees and taunting Impact to "save her." Moose tagged in and pretended to attack Valkyrie, but because of the mixed tag rules, he only cheap shotted Impact and tagged in Blanchard again. Blanchard locked in a really painful looking submission. She started chasing the Hammerlock DDT, but Valkyrie countered, dodged a spear launching Blanchard into the post, and Valkyrie finally made the hot tag to Impact. Impact came in and ran wild on Moose, hitting a standing Shooting Star Press for a two count. Impact started to chase Starship Pain, but Moose dodged and they began trading kicks. Impact countered a Go to Hell with a rana, but Moose came back with a senton for a near fall, and as he tried to follow with a spear, Impact dodged and hit a neckbreaker, but he was too close to the ropes for the pin. Blanchard and Valkyrie got tagged in, with Valkyrie controlling the action this time. Blanchard hit a ripcord cutter out of nowhere for a two count and once again looked for the hammerlock DDT. She got countered on and taken out with a German suplex pin by Valkyrie, but Moose pulled the referee out of the ring to stop the count. Impact dove on Moose, leaving Blanchard open for Valkyrie to hit a curb stomp and lock in an STF for the submission win. After the match, Moose hit Impact with a spear. Valkyrie got distracted with Moose, allowing Blanchard to hit her from behind. Killer Kross came down, and as Blanchard was about to hit Valkyrie with a chair, Kross stopped her, grabbing the chair off her hands. Brian Cage ran down and took out everyone, sending them away. Cage helped Valkyrie up -- and Impact and Cage ended the show by getting in each other's face. Overall, this was a fun show for Impact, particularly strong inside the ring and escalating the ongoing stories towards Homecoming. Next week, Moose takes on Cage and Santana faces Fenix. And in the last two Ultimate X qualifiers, Trey Miguel debuts against Trevor Lee and Rich Swann takes on Dave Crist.